In this talk, we discuss how the convergence of the cyber and physical world, and the tighter interactions between human users and their personal mobile devices, which are their proxies in the cyber world, are driving to the emergence of people-centric computing and networking paradigms, in which the human behaviour (e.g., the human social organization) becomes a key factor in the design of computing and networking protocols. The current Internet paradigm, which is infrastructure-centric, is not the right one to cope with such emerging scenario. This calls for a radically new Internet paradigm, that we name the Internet of People (IoP), where the humans and their personal devices are not seen merely as end users, but become active elements of the Internet. IoP is not a replacement of the current Internet infrastructure, but it exploits the legacy Internet services to achieve end-to-end connectivity on a global-scale. We discuss the key features of the IoP paradigm along with the underlying research issues and challenges. 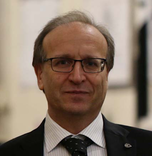 Biography: Marco Conti is a research director and scientific counselor, for information and communication technologies, of the Italian National Research Council. He has published in journals and conference proceedings more than 400 scientific papers related to design, modelling, and experimentation of Internet architecture and protocols, pervasive systems and social networks. He is the founding Editor-in-Chief of the Online Social Networks and Media journal, Editor-in-Chief for special issues of the Pervasive and Mobile Computing journal and, from several years, Editor-in-Chief of the Computer Communications journal. He has published the books “Metropolitan Area Networks (MANs)” (1997), “Mobile Ad Hoc Networking” (2004), “Mobile Ad hoc networking: the cutting edge technologies” (2013) and “Online Social Networks: Human Cognitive Constraints in Facebook and Twitter Personal Graphs” (2015). He has received several awards, including the Best Paper Award at IFIP TC6 Networking 2011, IEEE ISCC 2012 and IEEE WoWMoM 2013. In 2017, he has been included in the Highly Cited Researchers List released by Clarivate-Web of Science.He served as TPC chair for several major conferences, such as IFIP Networking 2002, IEEE WoWMoM 2005, IEEE PerCom 2006, and ACM MobiHoc 2006, and he was general chair (among many others) for IEEE WoWMoM 2006, IEEE MASS 2007 and IEEE PerCom 2010. He is the founder of successful conference and workshop series, such as IEEE AOC, ACM MobiOpp, and IFIP SustainIT.